It's been awhile since I've had time to read a book for enjoyment and I really do miss it. I was able to scrounge around for some time in order to read Masters of the Veil, the first in a trilogy, by Daniel Cohen. So I'm happy to give you a quick review on it before we showcase it during the May 24-31 $100 Amazon GC Bookblast. This is right up my alley. It resonates with my jocky half and my geeky half. I love the athletic character, as well as the magic involved. Filled with interesting and imaginative characters, the book is an interesting read, although it can be slightly cryptic at times. Join Sam on his journey as he discovers himself and takes us for a wild ride. What would you do if your life changed so drastically and suddenly when you are set for an all-star path? In short, the book is a nice whimsical read and leaves you wondering when the second book of the trilogy comes out. I'd give it 4 stars out of 5. Visit Daniel Cohen on his blog. 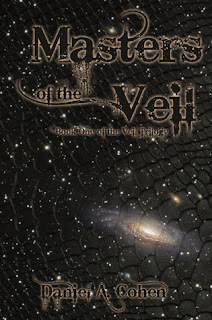 Buy It: Buy Masters of the Veil online.